Hafeez I, Alai MS, Iqbal K, Aslam K, Lone A, Bhat IA, Samer M. Lymphoma Presenting as Severe Left Ventricular Systolic Dysfunction: A Case Report. Oman Med J 2014 May; 29(3):223-225. Primary cardiac lymphoma is rare. Secondary involvement of heart by non hodgkins lymphoma is more frequent than primary. However, most cases are detected postmortem and the presenting symptoms being non-cardiac. Here we report a case where patient had heart failure as presenting feature of lymphoma. A 22-year-old male presented with features of heart failure. He had started with signs and symptoms of heart failure from the past one month. There was no history of hypertension, chest pain, or any preceding prodrome. On examination, pulse rate was 100/min, BP 100/80 mmHg, increased JVP, single enlarged posterior cervical lymph node and bilateral palpable flank masses, displaced apex beat and third heart sound. Electrocardiogram (ECG) revealed sinus tachycardia with normal voltages and chest X-ray revealed cardiomegaly. On echocardiography (Fig. 1), there was moderate pericardial effusion, severe left ventricular hypertrophy with hyperechoic pattern (interventricular septal diastolic thickness 20 mm, left ventricular posterior wall diastolic thickness 23 mm), normal valves, thickening of inter-atrial septum and right ventricular free wall, severe left ventricular systolic dysfunction (ejection fraction of 30%) and grade I diastolic dysfunction with normal atrial size suggestive of infiltrative disorder. On ultrasonography (USG), he had bilaterally enlarged kidneys (right 18×7 cm, left 20×7.6 cm) with heterogeneous echo pattern, normal hepato-biliary system and spleen. His hemogram revealed polycythemia, Hb of 19 gm/dL and hematocrit of 57% with normal total and differential white count and platelets. Blood chemistry revealed urea of 62 mg/dL, creatinine 1.7 mg/dL, uric acid 10.9 mg/dL, lactate dehydrogenase (LDH) 1541 U/L, normal liver function test, normal calcium and phosphorus. No protein was detected on 24-hour urine examination. In view of all these features, working diagnosis of infiltrative disorder was made and the patient was evaluated on that basis. Figure 1: 2D ECHO.Apical four chamber revealing severe concentric left ventricular hypertrophy and hyperechoic pattern. Noncontast computerized tomography (NCCT) abdomen (Fig. 2) revealed grossly enlarged kidneys with compressed renal sinuses. Cardiac MRI (Fig. 3) revealed an ill-defined mediastinal mass, enlarged pre-tracheal and para-bronchial lymph nodes, moderate pericardial effusion, concentric thickening of left ventricular wall and impaired contractility. There was no abnormal myocardial enhancement on late gadolinium enhancement images. Impression on MRI was mediastinal lymphoma with myocardial infiltration or leukemic infiltration of myocardium. HIV, hepatitis B and C serology were nonreactive. Iron profile was normal. Erythropoietin levels were increased 220 mIU/mL (4.30-29). Abdominal fat pad biopsy was negative for amyloidosis. Bone marrow aspiration was normal. Renal biopsy (Fig. 4) revealed renal parenchyma infiltrated by monotonous population of atypical lymphoid cells with intermediate-sized nuclei, scant cytoplasm, and scattered mitosis with unremarkable glomeruli suggestive of non-Hodgkin lymphoma (NHL). Excision biopsy of cervical lymph node was also diagnostic of non-Hodgkin lymphoma. 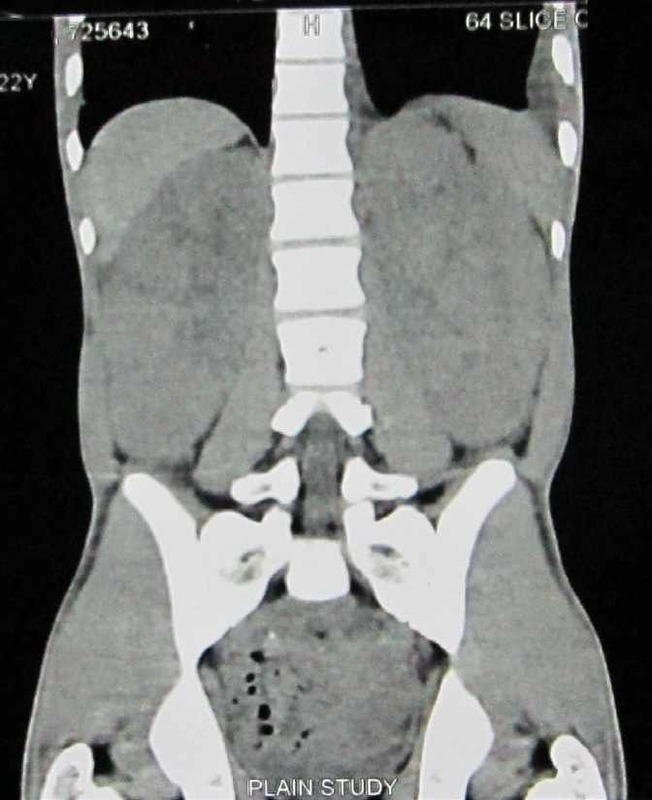 Figure 2: NCCT revealing markedly enlarged right and left kidneys. Figure 3: Cardiac MRI revealing myocardial infiltration with concentric left ventricular thickening. 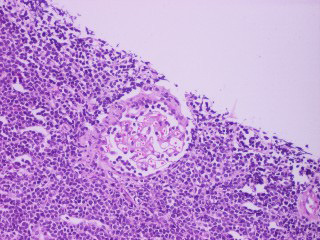 Figure 4: H&E staining revealing atypical lymphoid cells and unremarkable glomeruli. The patient’s heart failure was treated aggressively and was put on beta blockers, ACE inhibitors and spirinolactone. The patient was referred to the Oncology department where he was diagnosed to have diffuse large cell variant of non-Hodgkin lymphoma and was started on CHOP and rituximab regimen for NHL (6 to 8 cycles). The patient is undergoing treatment under the Oncology department and is also on cardiology follow-up. Primary cardiac lymphoma is rare. Secondary involvement of the heart by non-Hodgkin lymphoma is frequent than primary cardiac non-Hodgkin lymphoma and represents the third most common malignant tumor of the heart in autopsy studies.1 The disease may involve all cardiac structures,2 and in most cases, cardiac involvement is not detected before death because the clinical manifestations of cardiac involvement are nonspecific and first signs and symptoms are usually non-cardiac. Cardiac involvement as an initial presentation of malignant lymphoma is a rare occurrence,3 and is seen in 8% to 25% of patients who died from lymphoma at autopsy.4 Three mechanisms can be suggested to explain heart tissue involvement: direct neighbouring extension of the tumor from a primitive mediastinal site, retrograde flow through the cardiac lymphatics, and hematogenous spread.2 The pattern of cardiac involvement varies with different types of lymphomas suggesting that different types of lymphoma may have different mechanisms of metastasis to the heart. 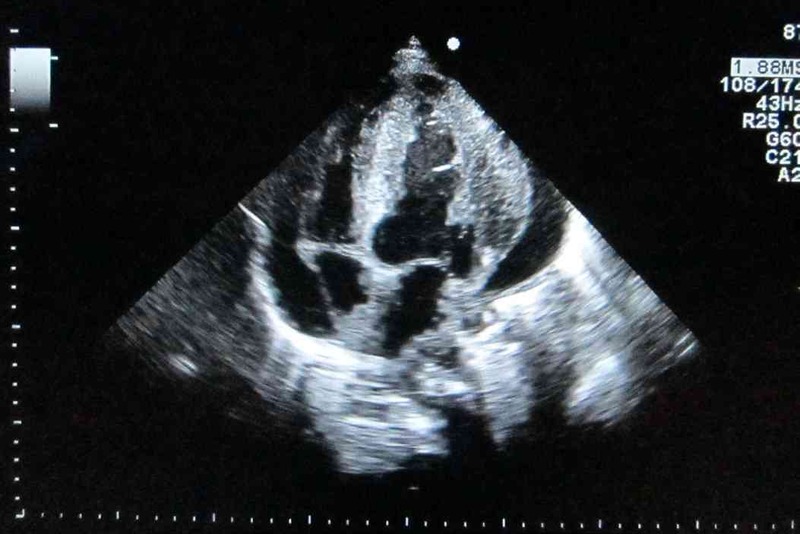 Pericardial effusion is the most common echocardiographic feature. Diffuse myocardial infiltration documented by echocardiography has rarely been described as a presenting feature of this condition,5,6 but it is commonly found post-mortem.7 This was the type of involvement seen in the presented case. Due to infiltration, the patient had developed left ventricular systolic dysfunction and had associated grade one diastolic dysfunction due to impaired relaxation; however, there was no evidence of any restrictive physiology. Evaluation was done on the lines of infiltrative cardiomyopathies (amyloidosis and hemochromatosis) which were ruled out. The patient’s echocardiographic features were further supported with cardiac MRI which was suggestive of myocardial infiltration. Harihuro et al.8 reported such type of myocardial involvement on autopsy in a patient who had diastolic dysfunction; however, there is no mention of systolic dysfunction in world literature as was seen in the case of this current patient. The age and mode of presentation of our patient with non-Hodgkin lymphoma (NHL) is very atypical with simultaneous involvement of two rare extranodal sites – the heart and kidneys. The mode of presentation was heart failure, which is rare, and there was diffuse cardiac infiltration with left ventricular systolic dysfunction. Such pattern of infiltration has not been described ante-mortem. Though presentation with heart failure is a bad prognostic sign, it will be worthwhile to evaluate response to treatment as there are reports of patients being successfully treated.13 The early detection of metastatic cardiac involvement can be beneficial for the patients because it can lead to careful monitoring and better management of morbidity. In all patients presenting with infiltrative cardiomyopathy, one should keep the rare possibility of metastatic lymphomas in mind. We acknowledge the help by the department of radiology in diagnosing this rare presentation. 1. Mioulet D, Braem L, Heno P, Paule P, Peloni JM, Bonnet D, et al. [Cardiac extension of a non-Hodgkin lymphoma revealed by an atrial flutter]. Ann Cardiol Angeiol (Paris) 2009 Apr;58(2):117-121. 2. McDonnell PJ, Mann RB, Bulkley BH. 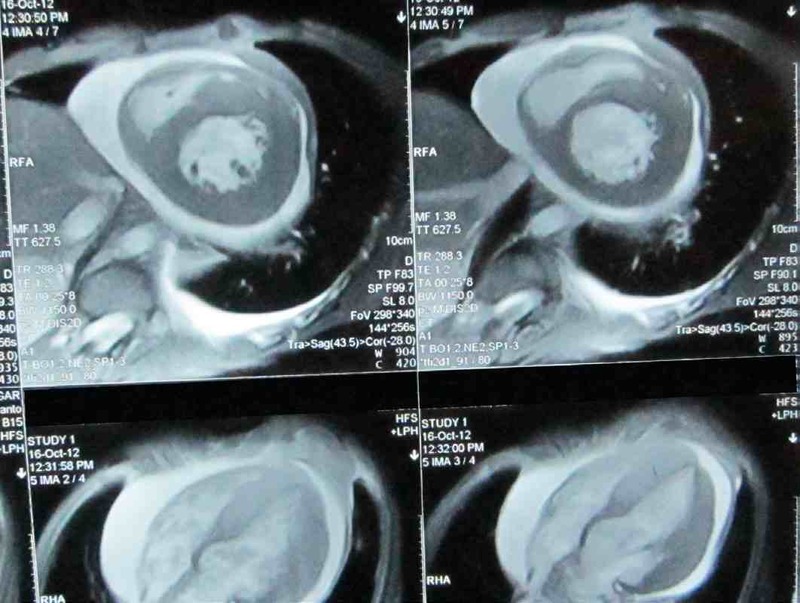 Involvement of the heart by malignant lymphoma: a clinicopathologic study. Cancer 1982 Mar;49(5):944-951. 3. Ban-Hoefen M, Zeglin MA, Bisognano JD. Diffuse large B cell lymphoma presenting as a cardiac mass and odynophagia. Cardiol J 2008;15(5):471-474. 4. Javier BV, Yount WJ, Crosby DJ, Hall TC. Cardiac metastasis in lymphoma and leukemia. Dis Chest 1967 Oct;52(4):481-484. 5. Roberts WC. Primary and secondary neoplasms of the heart. Am J Cardiol 1997 Sep;80(5):671-682. 6. Smith C. Tumors of the heart. Arch Pathol Lab Med 1986 May;110(5):371-374. 7. Klatt EC, Heitz DR. Cardiac metastases. Cancer 1990 Mar;65(6):1456-1459. 8. Toko H, Terasaki F, Kawakami Y, Hayashi T, Suwa M, Hirota Y, et al. A case of malignant lymphoma with diastolic heart failure. Jpn Circ J 1998 Nov;62(11):863-867. 9. Heiken JP, Gold RP, Schnur MJ, King DL, Bashist B, Glazer HS. Computed tomography of renal lymphoma with ultrasound correlation. J Comput Assist Tomogr 1983 Apr;7(2):245-250. 10. Cohan RH, Dunnick NR, Leder RA, Baker ME. Computed tomography of renal lymphoma 1990; 14:933-938. 11. Reznek RH, Mootoosamy I, Webb JA, Richards MA. CT in renal and perirenal lymphoma: a further look. Clin Radiol 1990 Oct;42(4):233-238. 12. Abdulwahab JA, Peter WK, Brian FS, Paul JH. Paraneoplastic Erythropoeitin- Induced Polycythemia associated with small lymphocytic lymphoma. Jcol 2006;24:2388-2389 . 13. Amirimoghaddam Z, Khoddami M, Nayeri ND, Molaee S. Hodgkin’s lymphoma presenting with heart failure: a case report. J Med Case Rep 2010;4:14.